Biz Carson/Business InsiderThe Click and Grow smart farm. Keurig sparked a revolution when coffee lovers discovered the ease of plopping in a cartridge and getting a cup of joe a few minutes later. A new startup, Click and Grow, now wants to bring the coffee cartridge craze to vegetables. Living up to its name, the Y-Combinator backed startup wants to make it as easy as a few clicks to grow enough food to feed your family, according its CEO and founder Mattias Leap. The startup has had success first selling smaller versions of its Click and Grow plant line. It raised more than $625,000 in a Kickstarter for its small three-plant herb garden, and it also has a line of smart pots. 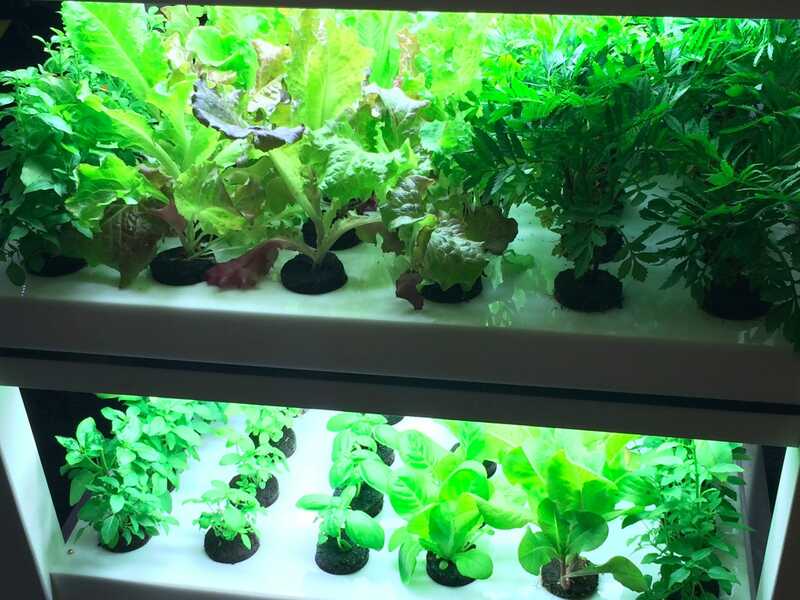 Click and Grow’s newest product though is a complete smart farm built into an IKEA kitchen counter. 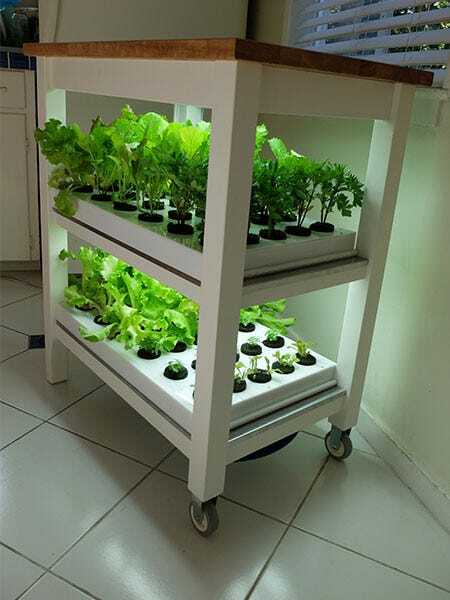 The $299 smart farm system comes with two racks that hold 30 plants each, for a total of 60 vegetables. Click and GrowThe full Smart Farm from Click and GrowVeggie lovers subscribe to a $29 monthly plan to receive 30 new cartridges of their choice, Leap said. The company makes plant pods for anything from salad greens like kale and lettuce to herbs like basil or vegetables like tomatoes. The plants both grow faster and contain more nutrients although they are not genetically modified organism, Leap claims. Click and Grow instead focused on the LED lighting and transforming the soil to be more oxygen efficient. Each cart also hooks up to a smart phone app so you can monitor and track the plants growth. All the user is left to do is refill the water tanks, hidden under the cart. Leap said that the amount of vegetables produced by the smart farm is enough to feed a family of four, although that’s if they are eating small quantities of the nutrient rich greens and not a salad every night. A basil plant, for example, lasts many more meals than a lettuce head. Once a person eats through a veggie, they can just replace the cartridge and a new plant will grow in its place. It’s not lettuce on-demand though. Growing is at the hands of mother nature so you’ll still have to wait around six weeks for your veggies to come to fruition.